Jurassic World has the second highest domestic box office opening weekend ever, taking in a reported $204 million (It also scored the biggest worldwide debut of all time, earning $511 million). It’s safe to say that a lot of people returned to the world of Jurassic Park this weekend, but were we all happy with the movie we got? Four of The Young Folks writers (Gabrielle Bondi, Jon Espino, Cachie Gonzalez, and Matthew Goudreau) sat down on Sunday night to talk about Jurassic World: what they liked, what they didn’t like, and some of the important topics the film brings up, like sexism and anti-militarization. We also discuss if we’re looking forward to another sequel and what we hope that sequel is about (If there is any doubt that there won’t be a sequel, please refer to the first sentence of this post). Read our discussion of Jurassic World below. 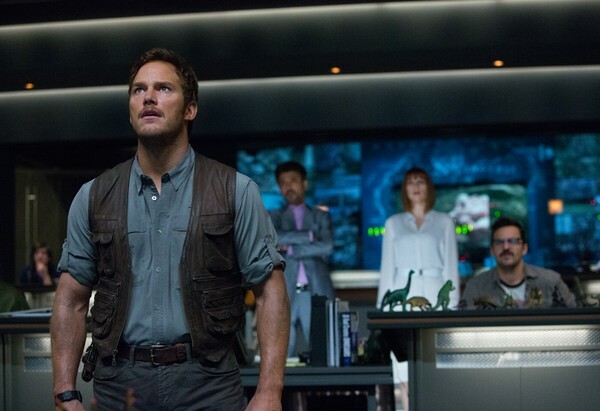 Gaby: Welcome to Jurassic World…our conversation review! Okay, so initial thoughts/stance on the film? Gaby: I went in with moderately low expectations because I wasn’t impressed by the trailers, and I was surprised. I really liked it. It was so much fun, and even though the plot and most of the characters were okay, it was very exciting throughout. Cachie: I like movies that make me feel…feels. LOL. Matthew: I found it to be a generic summer blockbuster. There were good ideas and a strong cast on paper, but I thought the execution was lacking. My biggest problem with the film as a whole is the lack of strong characters entangled in unnecessary plot points. Jon: I thought it was a very good effort, and it filled a vacancy in summer blockbusters that was previously unmet. It was energetic, engaging, and completely bombastic. Like most of the sequels, it is not without its problems, but sexism isn’t one of them. Cachie: I went in with a very open mind. I’ve been excited about it for a while, and I love Chris Pratt, but I do agree that the characters were a bit meh. Gaby: Let’s start off with the characters. What did you think of Owen and Claire? I really liked Owen. Chris Pratt made him incredibly charming. Frankly, this is the best Chris Pratt has ever looked, which helped. I wasn’t sold on Owen and Claire’s chemistry, though. Cachie: I don’t know, I like that we saw a slightly different Chris Pratt as Owen. Claire was super basic. At least to me…none of the characters really wowed me. I kind of wanted iconic characters, like we had with Dr. Malcolm and Dr. Grant…but I didn’t feel that too much. Matthew: Owen came off as a strange amalgam between Goldblum and Neill. I cringed at most of his one-liners, and I didn’t think he had much chemistry with Claire. The romance was completely unnecessary and distracting. I thought that Claire did not deserve the hate she received from the other characters. She was put in a tough situation, and it’s not as if she left her nephews completely unsupervised or waiting in the hotel. Gaby: I liked Claire more before she started caring about the kids. LOL. Jon: Owen was basically your man’s man, in tune with nature and his bestial nature so he was able to understand the raptors. Claire started out as a rigid, work-obsessed woman who figured out her priorities in life. She also tapped into her more bestial side and allowed herself to feel. Matthew: Owen could have been played by anyone. I didn’t think Pratt brought anything to the role that couldn’t have played by a similar actor. Jon: Well, Claire’s storyline was almost exactly like Dr. Grant’s in some ways. Cachie: I hated the romance and the way it was placed. The movie would’ve done just fine without it. Gaby: The last moment of Owen and Claire together was mad cheesy. Matthew: That scene you’re talking about made me roll my eyes. Jon: The whole film was cheesy, but it was consistent in that aspect. Cachie: THE KISS WAS HORRIBLY CHEESY AND TERRIBLY PLACED IN THE MOVIE. I mean, honestly? DURING A PTERODACTYL ATTACK? GET OUTTA HEREEEEE. Jon: Love was in the air. Jon: Aside from the pterodactyls. Cachie: I wanted to cut the romance out completely. LOL. It was dumb, and I didn’t feel Owen and Claire’s chemistry at all. It was actually just kind of awkward as a whole. Jon: It was less about chemistry and more about biology (<—science joke).